Knock their socks off with this beautiful bistro-style warm spinach salad! 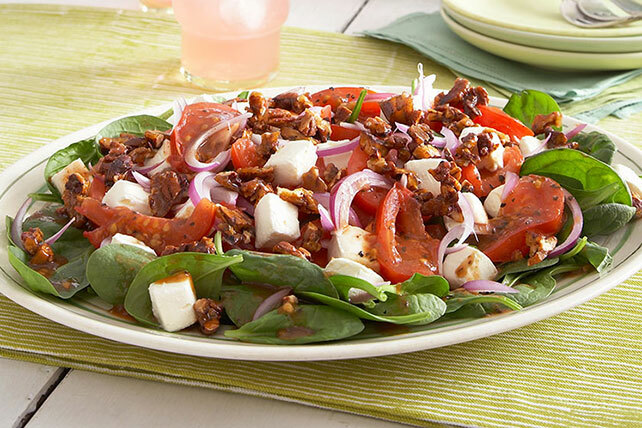 Serve a delicious Warm Spinach Salad with Tomatoes in just 20 minutes. Line shallow pan with foil; set aside. Spread sugar onto bottom of small nonstick skillet; top with nuts. Cook on medium-low heat 5 min. or until sugar is completely melted and golden brown, tilting skillet to evenly distribute sugar if necessary. Stir until nuts are evenly coated. Immediately spread into prepared pan; cool completely. Microwave tomatoes and dressing in microwaveable bowl on HIGH 3 min. or until tomatoes are slightly softened and dressing is heated through, stirring after 2 min. Cover platter with spinach; top with tomato mixture, cream cheese, onions and nuts. Toss lightly before serving. Substitute 1 cup KRAFT Shredded Mozzarella Cheese for the Neufchatel. For added crunch and flavor, toss salad with 4 slices cooked and crumbled OSCAR MAYER Bacon.